Reverse Osmosis Pure Water System. 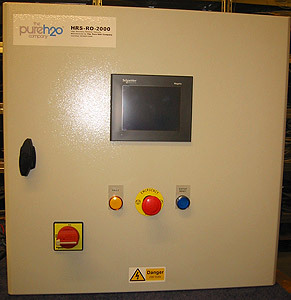 An easy to operate PLC led control panel to operate a Pure water Rig for bulk water production. To control supply pump, backwashing valves and feeding in and out level control systems. Interfacing with conductivity analog sensor and alarms. A bespoke designed PLC automated system with Schneider Twido PLC and Touchscreen HMI. Simple DOL Pump Starter and Extra Low Voltage interlocks and Level controls.